Hello, it is my third attempt to this game, first was one quarter of century ago (original civ), second was at the beginnings of this century (I met freeciv multiplayer and first longturn server was born from this relationship, but due to lack of players I lost interest), and now I realised that this abandoned child grows up and rule well. After many years I still see some minor flaws of that great game. For example straightforward initial strategy (born to born) or rather short tech tree if compared to game years (even moderate player can finish game before 2000). 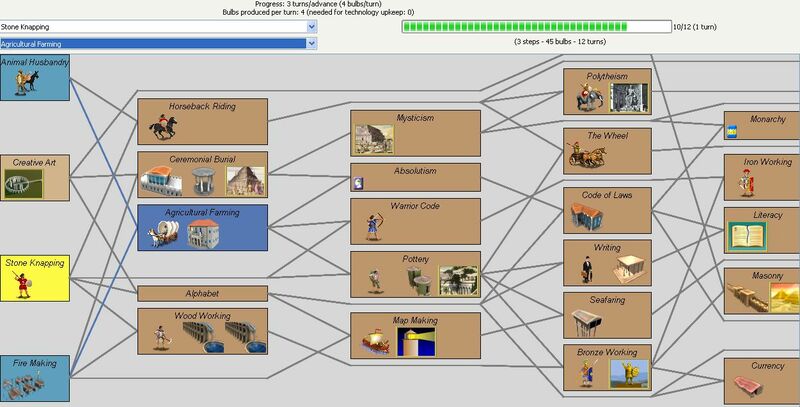 Here is my proposal of extended tech tree, beginning in stone age, with different initial strategies. At the start, player can make only migrants (or coinage), no settlers or other units nor buildings. Migrants are aggressive units, stats similar to Warriors, but they cannot conquer enemy town nor fortify. They can be used as militia though. Or can be used to build up capital town, as typical migrant. Settlers need Agriculture Farming knowledge (Fire making and Animal husbandry are prerequisites). Only Tribalism is available at this stage. Tertiary are: Polytheism, Code of Laws, The Wheel, Bronze Working, Seafaring and Writing (diplomat enabled). Because city walls are not easy accessible, I added Wooden Pre-Fortress (based on idea from LongTurn servers), which require only Forestry knowledge. Pre-Fortress prevents against kill-stack, but no defence bonus nor bribing protection - these are served by regular Fortress enabled by Construction, as usual. Pre-fortress is also groundwork for regular Fortress. I have no idea, how to add graphics properly to freeciv. If you want to see StoneHenge graphics, you need to edit or replace /misc/wonders-large.spec file. I tested it with rules based on standard civ2civ3 rules, with 2 settlers and one migrant initially, and it took about 10-12 turns to complete Agricultural Farming, but it can be speeded up if you are lucky explorer or have nice spot for towns. Another strategy is to develop how to make flint tools and make raid against another tribes - AI make this often. Finally, rulesets are attached below. Wahazar wrote: At the start, player can make only migrants (or coinage), no settlers or other units nor buildings. Migrants are aggressive units, stats similar to Warriors, but they cannot conquer enemy town nor fortify. They can be used as militia though. Or can be used to build up capital town, as typical migrant. I like this ruleset very much, but only for its realism and aesthetics. However, I fear it would only make the already slow first stage of the game even slower. With Workers in the 2nd column it will take a lot of time for the people to be able to actually start doing something and the game will be VERY static for more than a week, with everything moved further down the line. Also, I don't think that postponing further expansion (Settlers) so much makes sense. Hell, all those early people were basically doing was procreating and expanding. With all this, Tribalism really becomes an early stage in the development of the nation, but with distinct features and a specific role. Corbeau wrote: ... I fear it would only make the already slow first stage of the game even slower. With Workers in the 2nd column it will take a lot of time for the people to be able to actually start doing something and the game will be VERY static for more than a week, with everything moved further down the line. Are you talking about Longturn game? In such case you are right, it is slow because tech advances are slow, so it take about 40..45 turns to get Farming, while for classic ruleset, only 12..15, I don't know why (are there changed settings for LT bulbs?). If talking about postponing settlers: primitive tribes were limited to their caves. Your proposals are very interesting, but they need to implement new graphics, what is not convenient in case of freeciv. My intention was to alter rulesets and rely on existing graphics (the only one new is stonehenge, but lack of this graphic is not critical). Maybe we can apply these proposals for LT fork of neolithic ruleset discussed elsewhere. BTW, defence bonus depending on city size or city radius depending on government are brilliant idea. PS. what does mean "smallpox" ? Wahazar wrote: PS. what does mean "smallpox" ? Smallpox is the strategy/universal Civ2 meta of building every city exactly two tiles away from every other city, maximally saturating your territory with ridiculously closely crowded cities. The graphical result looks like the smallpox disease (in that your territory becomes covered in the "spots" of your cities). The strategy is often (or necessarily) combined with abusing the "rapture" mechanic or other 'celebrating'/high-luxury derived strategies where the player rushes to a Republic government, then jacks up the luxury rate. The "smallpox" empire is then rapidly and artificially ballooned into ludicrous sizes and power due to the free growth and lack of negative consequences in any city that is 'celebrating'. In such a strategy it almost doesn't matter where a city is placed, so long as it can generate enough trade to celebrate under a republic government. The scourge of civ gaming, I would say, but there it is. The strategy is the undisputed king of Civ2 under default rules, barring an early rush. EDIT: I found impr_req, but it is requirement for building to exist, not opposite one. EDIT2: how to force Tribal as default initial government type? (but I see nothing in Abkhaz ruleset, which would prevent such change). EDIT3: finally I changed allowed_govs in default/nationlist.ruleset, but is there possibility to define it for given ruleset? I cloned nationlist into my ruleset directory, but seems it is ignored/override by default/nationlist. Finally I finished new ruleset for Flinstones. Disclaimer - when I started this project, I wasn't aware about nextension project. This project doesn't pretend to be like nextension, which is kind of more detailed freeciv version, in this case it is just prehistoric add-on, which try to keep standard civ-like level of abstraction. However I reused 2 sprites from nextensions, credits are included in spec files. I implemented some Corbeau ideas. Initially you can build Tribe(smen) - universal units, they costs like Settlers, have stats like Wariors, behave like Settlers or Migrants (can build or add to city). Tribe require Tribe Hut to be build - one Tribe Hut is always build in first town, instead of Palace. Tribe Hut is obsolete by City Hall, Tribe by Settlers, both require Agriculture Farming. Additionally Tribe hut and City Hall remove production penalty (without these improvements, production is like for Depotism). Corruption and Waste is homogeneously 40% for Tribal gmt, but Tribe size is limited - above 8 towns, each 4 new town would produce unhappy citizens. You need Absolutism + Palace to change government to Despotism. Palace require City Hall. Important notice: initial town radius is 1. City Hall is required to increase this radius to default value. (BTW, very handy feature if you want to insert town into small unused area and forget about it). Other remarks: Tribe can do Worker jobs, but deforestation require Fire Making, planting forest: Wood Working, digging mine: Bronze Working. There are several strategies possible. and small city radius without City Hall. Or you can develop Farming and later Despotism, and make large cities. Unzip to your Freeciv*/data folder or share/games/freeciv folder and set Neolithic tilespec to see proper images. If you are using different tilespec, you will see alternative images (barbarian for tribe, courthouse for city hall). Wahazar wrote: EDIT2: how to force Tribal as default initial government type?